The RT-MINI Clear Snow Guard is manufactured in a premium, high clarity polycarbonate with UV stabilizers. A 2 to 1 base to blade ratio, 4.5 square inch holding area, and the gusseted blade snow pocket combine to effectively retain snow. Well suited for adhesive, or mechanical attachments, the RT-MINI features a blade "Snowflake" slot that accepts a metal color chip or custom emblem. These chips can be cut and installed in the field. Slot dimensions: width 1.850"/1.860", height 2.000"/2.030" and thickness .016"/0.050". The purpose of a snowguard is to help reduce a slide, not stop it. Due to varied roof geometries and structural strength, climatic conditions and snow melt rate, the manufacturer cannot and does not assume liability with respect to the suitability or use of this product. Liability is limited to replacement of non-standard manufactured product of cost of the respective product used. Fasteners should penetrate a solid structural member 1 inch, annular ring nail grip nails or screw type fasteners are recommended. Building codes, architects or engineers, should be consulted when pitch exceeds 12:12. When sealant/adhesive is required, the use of Surebond Everseal (SB-190) or Surebond Everflex (SB-1800) Adhesive caulk is recommended. Positioning of snow guards required for effective use: 2 groups of 3 staggered rows on 24 inch centers with 1 group at the eave and 1 group midway on roof slope. On long slopes, multiple groups with 6 ft space separation maximum. Snow guards are devices that are attached to the roof structure in order to uniformly retain and hold snow in place on the roof area. The snow guards need to be applied in sufficient quantity according to a prescribed pattern in order to be effective. Snow Guards are intended to prevent snow movement and provide for the controlled melt and breakdown of the snow mass into smaller sections. Snow Guard placement will vary from region to region and will be influenced by roof pitch, the lengths of roof runs and roof features. Local installation customs may not be the best guide for placement. Additional information can be found in sheet metal and air conditioning contractors' national association (SMACNA) architectural sheet metal manual. Ultimately a qualified professional should determine placement. 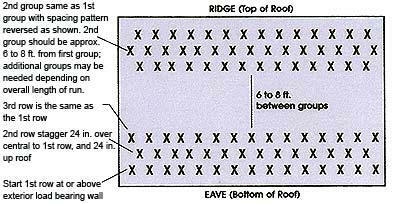 Snow Guards should never be placed beyond the bearing wall on an extended roof section. This can result in ice damming and cause structural damage. 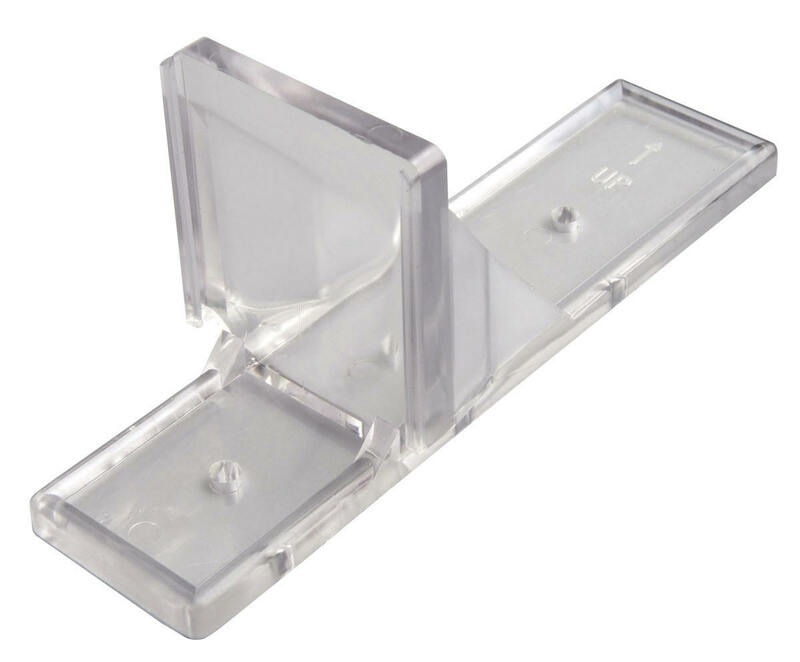 Surface mounted Snow Guards are provided with four starter dimples through which self-tapping screws may be driven. It is recommended that holes be pre-drilled before inserting self tapping screws. Fastener selection should be governed by substrate and anticipated loads, but stainless steel or corrosion resistant fasteners with neoprene washers should be insisted upon. Adhesive or sealant should be applied so as to completely cover the underside of the device before it is positioned. Sufficient compression must be created to squeeze adhesive/sealant out around its entire perimeter and a bead of the same material must be applied to create a waterproof joint free of gaps or air pockets.